Root canal procedures are used to repair and save a tooth that is decayed or damaged to an extent that it effects the pulp of a tooth. The pulp of the tooth is the soft tissue in the middle of a tooth that contains nerves, blood vessels, and connective tissue. The pulp extends from the end of each root to the pulp chamber, an area containing a mass of tissue in the middle of the crown of a tooth. 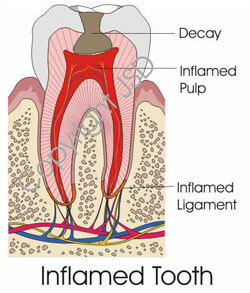 Root canals procedures are performed when the pulp becomes infected or damaged. Multiple tests and radiographs, images produced by x-rays, are used to determine which tooth or teeth are damaged and/or causing discomfort or disease. Several radiographs are utlized throughout the procedure to ensure adequate treatment. 1. An access cavity into the pulp chamber (a small hole made through the top of your tooth to access the nerve tissue). 2. Chemomechanical cleaning and shaping of the tooth to remove all diseased/infected tissues. 3. Obturation of the canals, a rubber like material (gutta percha) and sealer are used to seal the tooth and prevent reinfection. The number of visits will depend on your particular case. Some treatments take 2 visits while many may just need a single visit. Occasionally 3 appointments are needed. If multiple visits are needed a temporary restoration will be placed in access cavity to keep the tooth sealed between appointments. At the conclusion of treatment the access cavity will be restored with a permanent restoration by us or your dentist. 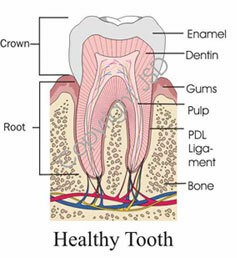 We will also discuss the need for a crown, or cap, to permanently restore and protect your tooth. In any case, your treatment time depends on the degree of infection/inflammation and degree of treatment difficulty. It is more important for the procedure to be done in the most effective way than based upon a specific time criteria. Endodontic treatment (root canals) have a very high degree of success, over 90% in some cases. There are, of course, no guarantees. We will discuss with you the chances of success before any endodontic procedure to help you make an informed decision. If a root canal or endodontic therapy is unsuccessful or fails, you still have options. Occasionally a tooth that has undergone endodontic treatment fails to heal or pain continues despite therapy. Although rare, sometimes a tooth initially responds to root canal therapy but becomes painful or diseased months or years later. When either of these situations occur, the tooth often can be maintained with a second endodontic treatment. If this is the case, again all treatment options will be presented to you. Our experience combined with your desires for the tooth in question will both be used to determine the best course of treatment for your individual case. Endodontic treatment has a high degree of success, for those teeth that do not respond to conventional root canal treatment or retreatment a favorable prognosis can often be achieved by a surgical procedure. Endodontic microsurgery, often called an apicoectomy, is procedure where the infected end of a tooth is removed, the remaining root structure is cleaned, and a filling is placed to seal the tooth from the end of the roots. In the past this surgery was performed using large instruments and equipment that were not designed for the small structures at the end of teeth. Currently this surgery is performed using a surgical operating microscope. With the increase in magnification more specialized tools and materials can be used to provide decreased healing time, decreased post-operative discomfort, and increased long-term prognosis. Regenerative endodontics (revascularization/pulpal regeneration) is one of the most exciting new developments in endodontics. This procedure is utilized in the case of a necrotic immature tooth with an open apex. Traditionally this tooth would be treated by a procedure called apexification, in which an artificial barrier is used at the end of a tooth to seal it, the tooth does not develop any further than it had at the time the nerve died. Revascularization is a biologically based procedure designed to replace damaged tooth structures allowing for an increase in both the length and thickness of root walls resulting in more predictable long-term retention of previously diseased teeth.